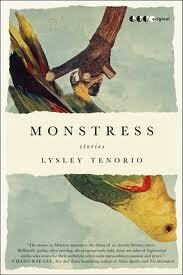 September’s SoS featured writer, Lysley (pronounced “Leslie”) Tenorio, is a very busy man these days. His recently published collection of short stories, Monstress, was given a starred review by Publisher’s Weekly, and critics have used words like “luminous,” “bold,” and “electric” to describe the eight stories in the collection. These tales, about a ragtag collection of misfits, charlatans, and dreamers, are set in San Francisco and in the Philippines, where Tenorio was born, and from which he emigrated with his family when he was seven months old. He’s currently teaching at St. Mary’s College in the Bay Area, and I caught up with him just before he was scheduled to leave for Ireland, where he’d been invited to read at the Cork International Short Story Festival. Lysley, thanks for taking the time to be interviewed for our blog. I’m curious about something I read in a recent article in the SF Chronicle, which referred to you as a “literary shape-shifter,” and linked your stories, with their odd and quirky characters who often straddle two worlds, to your having grown up in Sana Francisco and the Philippines. Do you see yourself as a “literary shape-shifter?” How does your background as the American-raised child of Filipino parents inform your stories? I wish I could see myself as a literal shape shifter, as shape-shifting is one of the best superpowers to have. As far as being a literary shape-shifter? I’m not so sure. Maybe to the extent that I like to change up voices and premises and tones from story to story, I do some shape shifting. As for my upbringing, I think that influenced a lot of the emotional, psychological, and thematic concerns of my stories–far-fetched as some of those stories might be, those concerns are in there. Your stories seem to flow along so effortlessly—they’re funny, outlandish, wry, and full of emotion, all springing forth in what seems a very clean and natural way. How much work does it take to achieve this seeming effortlessness? What’s your revision process, and how many revisions might a story go through? Revision is a slow and long process. When I finish a first draft, I start the second from the very first word. Same goes for the third, and the forth, until I get it right. I believe that altering one word means reconsidering the words around it, the sentence, the paragraph, the scene. I don’t necessarily recommend revising this way, but it’s the way I know how to write. You seem comfortable writing in a man’s, woman’s, or child’s voice. One reviewer mentioned the child narrator of your short story “Superassasin” as “one of the few instances where a writer gets a child narrator right.” How do you manage to so thoroughly inhabit these various characters? It probably has to do with all those drafts I mentioned above. You put together an astonishing string of fellowships—Yaddo, MacDowell Colony, the Stegner Fellowship at Stanford, the National Endowment for the Arts—which you credit for allowing you the time to finish your collection Monstress. Now, you’re teaching at St. Mary’s College Do you find that teaching has affected your writing? Teaching keeps me on my toes. If I’m paying close attention to my students’ work, then I need to hold myself up to the same standards. It also forces me to read literature that I might not read on my own– I just read some of Darwin’s “The Origin of Species” and was struck by how beautiful some of the writing is. “Monstress,” the title story from your recent collection, and the one being read at Stories on Stage, is set in the world of B horror movies. How did you happen to choose this setting? Are you a fan of B movies? I’m sure you’ve read your own work before an audience dozens of times. But, have you ever had to listen to your story being read by another, as it is at Stories on Stage? What will it be like for you? Terrifying? Exciting? Both? I’ve never heard my work read by someone else, so I’m very much looking forward to September 28. Sue Staats recently received her MFA in Fiction from Pacific University. She’s currently revising her novella, The Mitchell Boys, and working on a collection of linked short stories. Her short story “No Hero, No Sharks” was runner-up for the 2011 Gulf Coast Prize in Fiction, a finalist for the 2011 Reynolds Price Fiction Award, and was published this spring in The Farallon Review. Her fiction, non-fiction and poetry have also been published numerous times in Susurrus, the literary journal of Sacramento City College.